Tonight The Sing-Off is getting into the spirit of the season with an all new holiday special! This season is actually being condensed into two hours and the winner of The Sing-Off will be chosen at the end of the special. Host Nick Lachey joined a press call to chat about the show and some of his personal holiday plans (including the imminent arrival of a new baby). Check out what he had to say below. 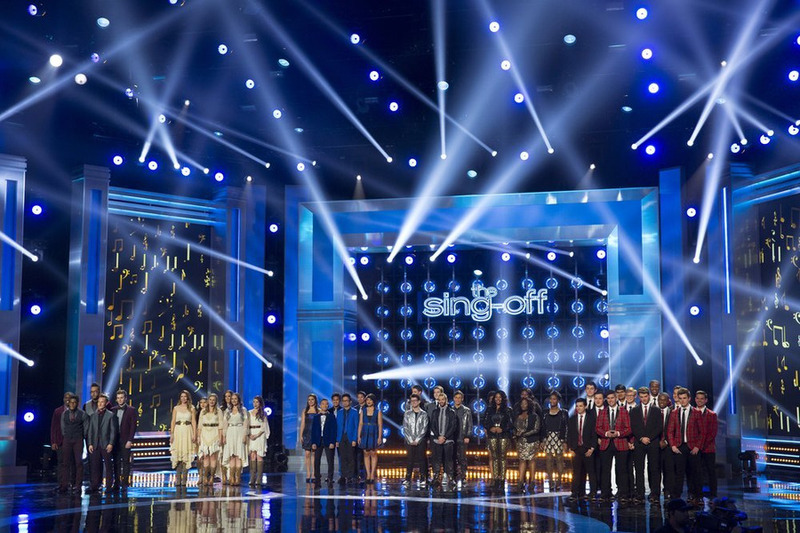 The Sing-Off Holiday Special airs tonight at 9pm ET on NBC. Set your DVR so you can rewatch it with your families when they get together this holiday season. You have a change-up at the judges’ table. How has that been? Nick Lachey: We were so sad that Ben Folds couldn’t be back with us this year. Obviously, he’s become a staple of the show and been with Shawn and I since the very beginning. His schedule wouldn’t allow him to be here for this year’s show. But, very very excited to welcome Patrick Stump, the lead singer for Fallout Boy to the show. He did a great job and brought a different perspective. Every judge brings their own perspectives and experiences to the table. Patrick certainly brought his to the table. I think our group’s really benefited from his insights. Can you talk about the groups competing? Nick Lachey: We have 6 groups total starting out the show. We’ve got a collegiate group from Vanderbilt. We’ve always had collegiate groups on the show, that kind of extends that streak. We have a group of alumni who have been apart of other groups in the past, but have come together and reconfigured themselves to form a new group called “The Exchange.” We have a group of young ladies from New York City, who kind of grew up in the church—a little more soul church based sound. We have a group from Yale—they actually take a sampler and sample their voices live on stage. It’s still a cappella, but it’s a cappella with a little bit of a twist with technology involved. We have a group from Nashville who’s great group of singers, also from church experience, but really really solid. And a group from San Francisco a pretty new group that formed for the show. The great thing about The Sing-Off is that it’s given such a face to a cappella music that it inspires groups to form for the show. We saw that with Pentatonix in season 3, they formed for the purpose of the show and went on to win it. Now they’re just killing it out there. It’s great to see new groups, new talents inspired by what groups in the past have done. Can you tell us about your holiday plans and some of your family’s holiday traditions? Nick Lachey: I think holiday plans for me have always revolved around family, as most people’s do. It’s just the time of year to be with your loved ones. Now as I’ve started my own family, it certainly revolves around my wife, Vaness, and our son, Camden, and we’re expecting a little girl pretty much at any time now. So we’re celebrating, but we’re celebrating with one eye on the contraction clock, if you will. So we’re ready to head to the hospital if we have to. It adds a special dynamic to this holiday season for us, knowing that we’re getting the best gift of all in a daughter at some point. The decision to condense the show into just one episode, did that have anything to do with your schedule and the baby? Nick Lachey: No, no, not at all. That was a programming thing per NBC and something that they would have to speak to. That’s actually got nothing to do with my schedule. I can speak for all of us who are part of the show that we’re excited it’s coming back in any form – whether it be a 12 episode season or 2-hour holiday special. We’re fans of the show because it truly is a passion project for us and a cappella is a passion for all of us. It’s exciting to be a part of this again this year. Is the arrival of baby #2 going to have an impact on your upcoming schedule? Nick Lachey: I’m fortunate that I do get a little time off. I’m hosting a show here in New York, and we’re on hiatus for all of January, so it’s great timing for me that I’m able to be at home with Vanessa and the baby and take a little time off. You certainly won’t want to leave, but at some point work must go on. So I get back into it here shortly after, but I do get a little time off, which is great. What’s the status of the bar show? Nick Lachey: We’re in production right now and hoping to open the bar here shortly—the next few weeks. So it’s an exciting thing to be involved with as well. It’s unchartered territory for my brother and I. We’ve never opened a bar, and certainly never done it in front of cameras. Trust me when I say it’s an experience we’ll all share together on TV. Have you learned any lessons the hard way from that so far? Nick Lachey: Yeah, I learned not to open a bar. No, I’m kidding. It’s a lot of fun and, honestly, we have great partners and we’re very excited. Cincinnati is home for us and to be able to go and do that there…there’s a lot of anticipation for it. It’s great. We feel great about where it is, about the concept, about the build out and all that good stuff. There’s going to be some hard learned lessons along the way, but so far it’s been relatively smooth sailing. Knock on wood. What are you most looking forward to about having a little girl? Nick Lachey: I don’t know, honestly! I can only guess it’s going to be different in ways that I don’t even expect. I think there’s something special about that bond between father and daughter, which I’m excited to experience first hand. But, it’s hard for me—I can’t imagine loving a child more than I love my son so it’s going to be a different kind of love. It’s an exciting chapter in our life as a family, and [I’m] looking forward to whatever it brings. I haven’t tried to predict how I’m going to feel or how it will be different. I’m just going along for the ride and enjoying every second. Nick Lachey: It’s always a challenge for anyone who’s got to balance family and work. You want to give your 100% to every thing you do. My role as a father and husband is certainly no exception to that. It’s about making time for everything and […] walking that fine line which is a challenge. But it’s definitely a challenge I’m excited to have. You just got to carve out time for everything. Nick Lachey: We love to go to the park. I love to, personally, wrestle with my son. That’s kind of our thing. We wrestle and rough house. It’s just about spending time together about those moments you don’t ever want to take for granted-whether it’s a walk to the park or a walk down the street or going to get ice cream or whatever it is. It’s an experience together. That’s what’s important.